Chex Mix Candy and Ritz Cracker Toffee Candy are both so good they’re addictive. 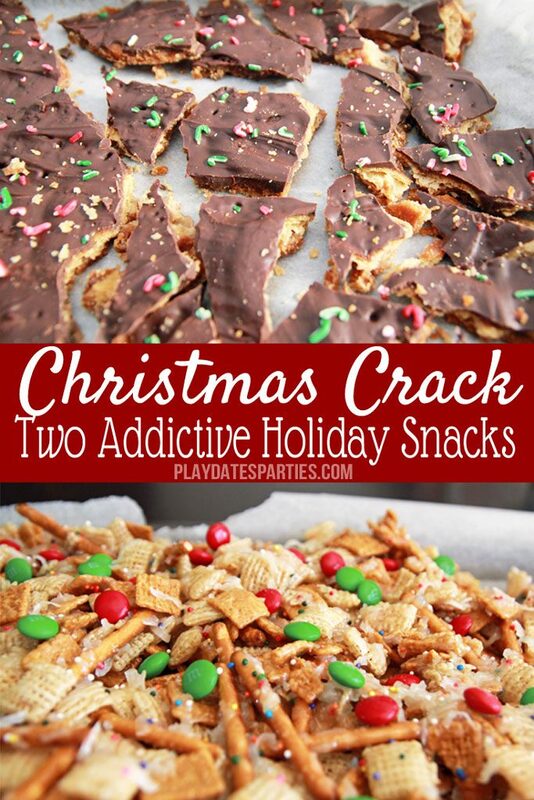 We call them Christmas Crack, but you can just call them awesome! 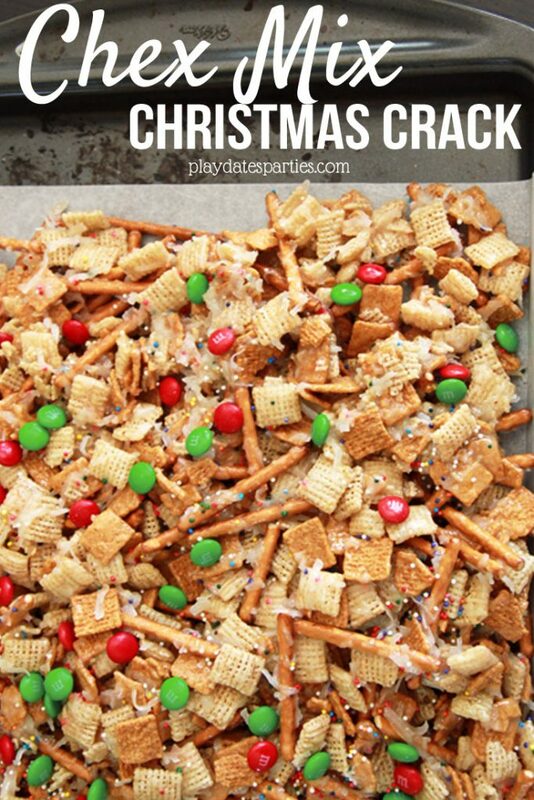 A couple years ago I remember seeing a post on Pinterest titled “Christmas Crack”. For some reason I didn’t click through at the time, but the title obviously left an impression. 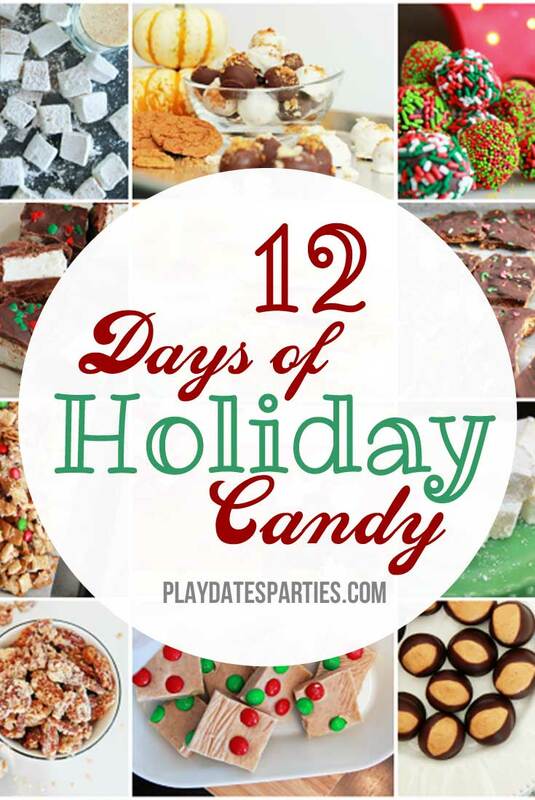 And when starting the 12 Days of Holiday Candy series, I immediately went looking for that old pin. 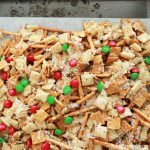 Little did I know that search would result in two amazing Christmas Crack recipes: Chex mix candy and Ritz Cracker Toffee candy. So I did what any good sweets addict would do. I made both. 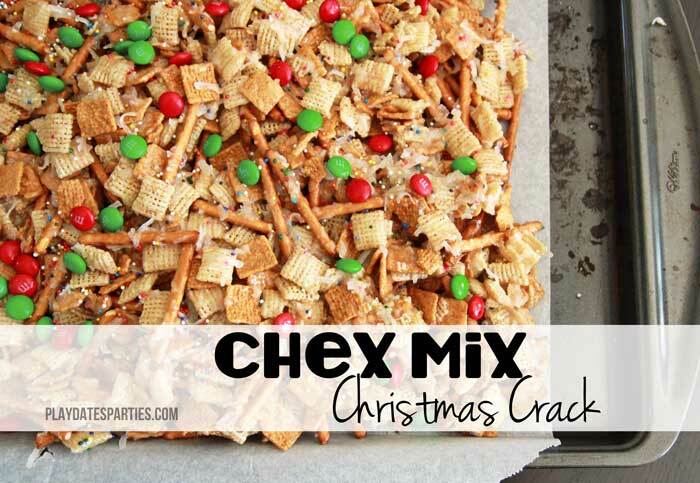 First was a sticky, gooey chex mix candy. The original recipe over at Simple Fare Fairly Simple used almonds, but I switched those out for pretzel sticks. That proved to be the right choice, because OMG. It’s the perfect combination of sweet and salty. This sticky, gooey chex mix candy is the perfect combination of sweet and salty. You won't be able to keep your hands off of it! Combine Rice Chex and Golden Grahams, coconut and pretzels in a large mixing bowl. Stir to combine. In a large sauce pan, cook butter, sugar and corn syrup to about 234 degrees (also known as the "soft ball" stage). Pour the syrup over the cereal mixture and stir until thoroughly coated. Spread mixture out onto a large cookie sheet. 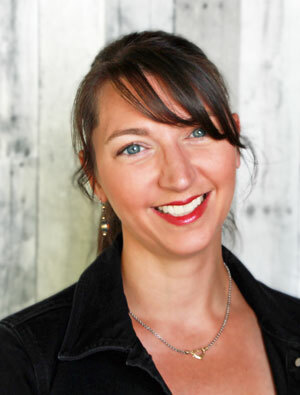 Tip: Spray forks or spatulas with cooking spray and use them to spread the mixture out as much as possible. Sprinkle with M&Ms and nonpareils for color. Cool completely. Break into chunks for serving. If you want to make the candy less sticky, separate the mixture into very thin layers on multiple sheet pans and bake in a hot oven (400 degrees or so) for a few minutes before adding the sprinkles and M&Ms. This should increase the temperature of the syrup mixture to the "hard crack" stage. Small chunks are key with that method, as the end result will be very hard to chew. Let me just say…this recipe is so easy it’s dangerous. One of the things that makes it so easy is that it doesn’t require a candy thermometer (thank goodness for that!). And it’s ready to devour in about an hour. And you will definitely devour it. 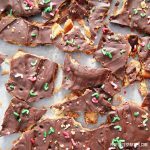 The husband got a sweets craving the other night after the kids were in bed…and it was nothing to whip up a batch of Ritz Cracker Toffee. 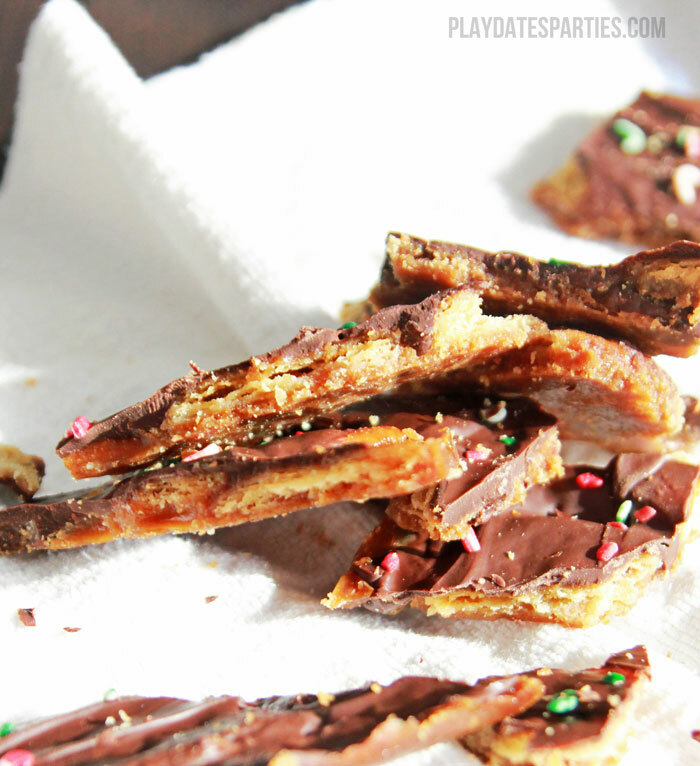 It also has a sweet/salty thing going on, and the crackers add a light, airy texture to the toffee. Love. 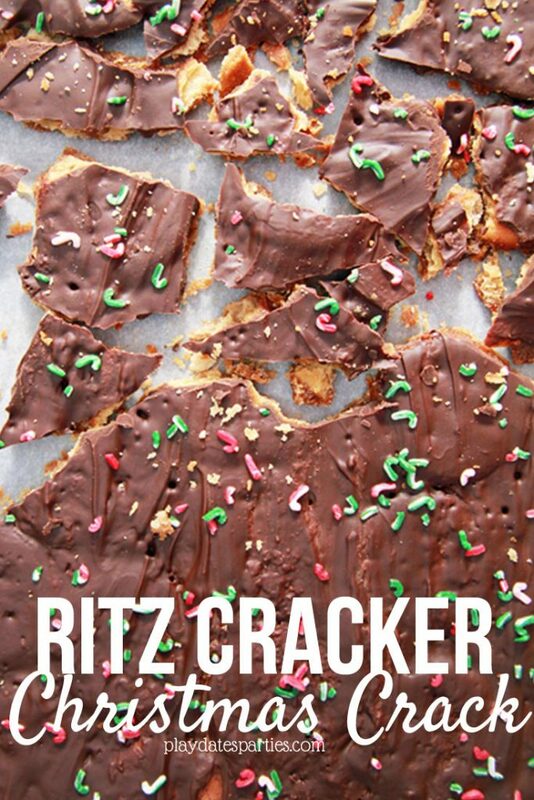 No thermometer required, and ready to eat in about an hour, Ritz cracker toffee is super simple and highly addictive! Preheat oven to 400ºF. Line a standard size jelly roll pan (a cookie sheet with sides) with parchment paper. Make sure the entire bottom of the pan is covered, and crease the paper at the sides so the parchment lies as flat as possible. If you like you can butter the parchment paper, but it's not necessary. Prepare a spatula with nonstick cooking spray. Place crackers in a flat layer on top of the parchment. Melt the butter in a medium sauce pan (2 to 3 quarts). Add brown sugar and stir until mostly combined or mixture starts to boil. (My butter and sugar didn't completely combine until it reached the boiling point) Lower the temperature to a simmer, set your timer for 3 minutes and walk away. Do not stir the toffee mixture during this time. Pour toffee mixture over crackers and use the prepared spatula to spread the mixture over and around the crackers. Try not to let the crackers overlap. Bake for 6 minutes, checking to ensure the toffee mixture isn't burning. After six minutes carefully remove the pan from the oven and sprinkle chocolate chips on top. Return the pan to the oven for 30 seconds to 1 minute, until soft. Using a clean spatula, spread chocolate in an even layer over top of the toffee. Add sprinkles, chopped nuts, or whatever other toppings you like at this point. Cool on the counter for 10 minutes and then transfer the pan to a refrigerator for 45 minutes to 1 hour. Break into small pieces and store in an airtight container. I can’t believe it took me so long to try these recipes. But what I can say is that they are both dangerously addictive. What would you add to these recipes to make them your own? Do you have your own version of Christmas Crack? Thanks you so much for sharing! I can’t wait to try it out- looks delicious!